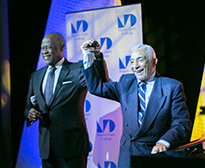 The Miami Dade College was the host of a lively music reunion with icons Rafael Solano and Johnny Ventura, distinguished promoters of Dominican music,who participated on Thursday, October 23, 2014 in the Dominican Get Together event, an initiative of the Global Foundation for Democracy and Development (GFDD) and its sister organization in the Dominican Republic, Fundación Global Democracia y Desarrollo (Funglode), and with the support of the Dominican Students Association of MDC and the Dominican Consulate in Miami, FL. 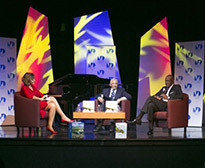 In the conference called From Composing to Interpreting Dominican Music “El Maestro” and “El Caballo Mayor”, the distinguished guests’ shared their experiences and anecdotes throughout their long career. 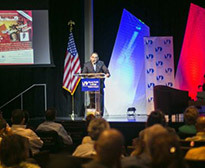 José Vicente, President of Miami Dade College, gave the welcoming speech, where he acknowledged the assistance of the public, particularly the Dominicans living in Miami. Mr. Vicente said the Miami Dade College, recognized educational institution in Florida, has a close collaborative relationship with GFDD since its inception. Natasha Despotovic, GFDD Executive Director, presented the institutional video of the Foundation, followed by the screening of a video that recounted the history of the two artists. Despotovic expressed the honor it is for GFDD and FUNGLODE that these two renowned representatives of the Dominican music have shared their valuable time to talk about their experiences and stories with the Hispanic community of the United States, especially the Dominican diaspora. During the roundtable discussion both musicians talked about their beginnings in music and how each worked his way into the music field. They also commented on their favorite artists, their musical tastes and influences. Solano mentioned CarlosGardel and Frank Sinatra as his main influences, among others singers. Meanwhile, Johnny Ventura said he loves to listen to classical music. 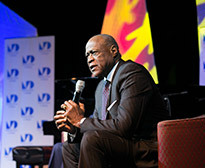 While talking about the beginnings and evolution of merengue, Johnny Ventura said that years ago he traveled to Africa and found that nowadays, the musical rhythms and instruments does not resemble anything like the origins of merengue, nor is anything like the currently merengue rhythms of the Dominican Republic. Meanwhile, Rafael Solano said that merengue is not and will never be in crisis, unlike the Dominican bolero that, unfortunately, is going through a crisis, and has failed to maintain its place in the public taste. One of the surprises of the night was when a video of renowned musician Emilio Estefan screened congratulating Solano and Ventura for their contribution to the Latin-American music. Among the stories that each musician shared with the audience, Johnny Ventura pointed out that the first time he gave a concert at Madison Square Garden in New York, producers only put a fragile rope to secure the stage perimeter, but the female crowd was very excited with his presence and they knocked the security rope. Since then, producers started installing metal bars in front of the stage at his concerts. Rafael Solano said the song "Por Amor" is the Dominican tune that has been recorded by more international artists abroad than anyone, and that makes him very proud. Interestingly, he explained that the song is a religious one and that his inspiration came during the years when he lived in Puerto Plata, where he was an altar boy and was linked to the Catholic Church. 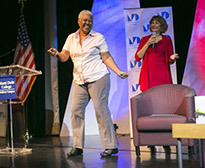 The event also featured a karaoke session, where several participants interpreted the songs from both singers, resulting winners: Carlos Fernández, Evangelina Villera y Esperanza Petronilia. All were awarded with GFDD publications. Dominican Get Together is an initiative of GFDD and Funglode, whose purpose is to unite the Dominican diaspora residing in the United States. GFDD is a nonprofit, non-partisan organization dedicated to the advancement of global collaboration and exchange relevant to Dominican professionals, general audiences and institutions in the homeland and abroad. The Foundation conducts research, enhances public understanding, designs public policies, devises strategies, and offers capacity building in areas crucial to social, economic, democratic and cultural sustainable development.